Prominent & Leading Manufacturer from Coimbatore, we offer forged ball valve body. We manufacture a wide range of industrial valves serving oil and mining industry. Forged Ball-Valve Body for Petroleum Valvesis highly recommended amongst our client for its good price. 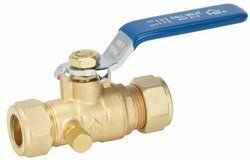 Our offered Forged Ball-Valve Body is used much other industrial purpose. Looking for Forged Ball Valve Body ?